Grassy flavors include vegetal, plant-like, hay, fresh leaves or aromas reminiscent of fresh cut grass. These flavors tend to be more pronounced in light flavored beers like wheat beer, Koelsch, Pilsners, Helles, light lagers and Cream Ale. The BJCP describes it as a green leaf or fresh cut grass aroma. The flavor and aroma is associated with chlorophyll which is the compound in hops and malt that allows plants to convert light into energy. The most common cause of strong grassy off flavors is poor storage of either malt or hops. In particular storing either in a moist or hot environment can create aledehydes in addition to mold that can manifest green flavors. Moist hops and grain can yield grassy flavors. In fact, some brewers experiment with “wet hops” which are freshly cut hops that have been harvested recently but not dried and grassy flavors in these beers are common. A second cause of grassy flavors is excessively long hop contact times. This can occur either during the boil or when dry hopping though it is more common in dry hopping. For example if you “keg hop” where you leave hops in the keg indefinitely it is possible to develop grassy flavors over a period of weeks and months. Recent research indicates that short dry hop contact times are better with peak flavor often achieved in 24-72 hours, and dry hop times should certainly be kept below two weeks. For the boil, its best to separate your wort from the hop trub at the end of the boil. Long boil times can create grassy flavors as well, though it is less common. Generally this is associated with boil times longer than 90 minutes, though some sources recommend keeping hop boil times to 60 minutes or less. Honestly the hop utilization difference between 60 and 90 minutes is pretty small, so I tend to keep my hop boil times at an hour or less. Using an excessive amount of hops can result in grassy flavors. This is common in some super-hopped IPAs where the brewer is pushing 100 IBUs or more. The ability of an average drinker to discern bitterness tops out at around 80 IBUs, and as we push into hundreds of IBUs we end up adding other off flavors instead of more bitterness, with grassy off flavor from the hops being a common outcome. So if you are super hopping your beer, be aware you may be adding off flavors as well. Beers that feature other vegetables can also suffer from grassy flavors. Veggies and certain herbs can introduce additional chlorophyll which may result in off flavor. 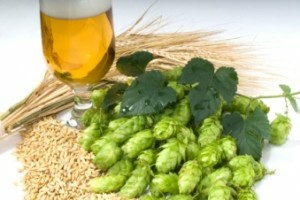 A final cause for grassy flavors is the variety of hops used. Some hop varieties naturally have a slight grassy flavor. These include Fuggles, Mosaic, Tradition, Boadica, and others. While these varieties have excellent flavor and aroma, it is best to avoid very long contact times when dry hopping or boiling with these hops. That is a summary of how to reduce grassy off flavors in your home brewed beer. Thanks for joining me on the BeerSmith Home Brewing Blog. Be sure to sign up for my newsletter or my podcast (also on itunes…and youtube…and streaming radio station) for more great tips on homebrewing. Also check out the How to Brew Video series I shot with John Palmer if you want to learn more about all grain brewing. I’m just starting to keg hop per the feed-back from some local (multiple-award winning) homebrewing clubmates. They keg hop and don’t seem to have any problems. Now, that may be due to the fact that their stuff is just so good it doesn’t last long enough! 🙂 However, they did suggest to me that they leave hops in for extended periods without issue. I’d be interested to hear what others have found with this. Great tips about hop management. I didn’t realize that hop contact time was a source of grassy flavor. I started growing my own hops. My question is how much fresh hops would you use in relation to the pellet form by weight?